Harry Reid forces the hand of Senate Republicans on nominations. But he should not take the “nuclear option” off the table anytime soon. Harry Reid threatened to employ the “nuclear option” to end filibuster abuses, and the world did not end. In fact, despite all the absurd rhetoric that flew around as the Senate majority leader prepared to implement a majority-rule standard regarding presidential appointments, Reid’s gambit yielded some positive results. Under an agreement reached Tuesday morning, Republicans would stop blocking votes on five key nominations, including those of Richard Cordray to head the new Consumer Financial Protection Bureau, Gina McCarthy to serve as EPA administrator, Fred Hochberg to serve as president of the Export-Import Bank and Thomas Perez to serve as secretary of labor. By midday Tuesday, the Senate had already voted to allow formal consideration of Cordray, with seventy-one senators agreeing to schedule a confirmation vote. But the path to making the Senate a fully functional legislative chamber is less clear than the inside-the-Beltway celebrants—some in the Senate, most in the media—would have Americans believe. “There is not one intellectual argument…[for] why those nominations shouldn’t go forward. It’s just [that Republicans] want their pound of flesh from working people in this country, and this is where they’re going to get it because they were able to convince four or five Democrats to go with them,” griped Cohen. The determination of McConnell to continue meddling with NLRB nominations should be cause for caution, and strategic common sense. Reid should not back away from the “nuclear option”—using the Democratic majority to rewrite Senate rules to allow for majority-rule votes on confirmation of presidential nominees—anytime soon. If the agreement on the NLRB nominees advances, the White House must nominate two new candidates immediately. The Senate Committee on Heath, Education, Labor and Pensions must hold hearings and a full Senate vote must be scheduled and completed before the Senate begins its August recess. A failure to complete the process in a timely manner threatens the functionality of the board, which would be a huge victory for McConnell and a huge defeat for the tens of millions of American workers who look to the agency not merely to make decisions regarding the role of unions in the workplace but also to decide whether corporations are using unfair labor practices to threaten the rights of workers. 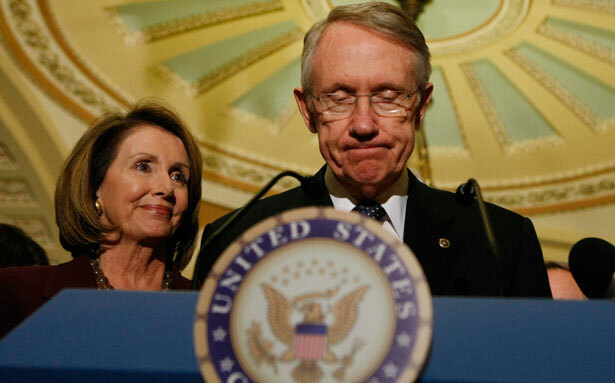 It is that prospect that Reid must avert by keeping all options for Senate rules reform on the table. Unfortunately, Reid has continually attempted to avert the reality of reform by cutting deals with McConnell and other Republican senators. The majority leader’s compromises on the issue have—as Reid now acknowledges—frequently fumbled. In an ideal circumstance, Reid and his Democratic colleagues—as well as some responsible Republicans—would understand the value of meaningful rules reforms, which would restore the traditional filibuster along lines that Americans know best from the film Mr. Smith Goes to Washington. The point of filibuster reform is not partisan or ideological positioning. It is to restore functional processes for legislating and governing. At this point, like it or not, Reid is holding to the view that he can cobble together agreements to achieve that goal. Savvy senators such as Vermont independent Bernie Sanders and Oregon Democrat Jeff Merkley are highly dubious, as they have indicated. But one thing that Reid and every member of his caucus should be able to agree on is this: the option of a quick vote to reform Senate rules in order to advance nominations should not be taken off the table during the coming wrangle over the future of the NLRB. John Nichols and Robert W. McChesney are the authors of the new book Dollarocracy: How the Money and Media Election Complex is Destroying America (The Nation). Author Thomas Frank says: “This is the black book of politics-as-industry, an encyclopedic account of money’s crimes against democracy. The billionaires have hijacked our government, and anyone feeling complacent after the 2012 election should take sober note of Nichols’ and McChesney’s astonishing finding: It’s only going to get worse. Dollarocracy is an impressive achievement. How long can Mitch McConnell’s “tyranny of the minority” last?